Why do they call it bread when it is really cake? 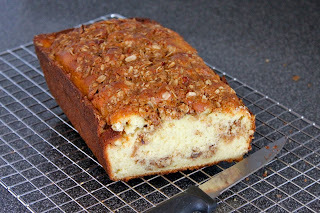 I made this quickbread a couple weeks ago and am only just not getting around to posting it. I have not had much time to bake. Between having a newborn son and packing our house for a move, there is not much time to bake or blog. You see, in just under a month we will be leaving our home in Washington DC and heading south to Atlanta. We are excited for this next journey in our lives together, but are definitely sad to leave friends and jobs we love. We are very much looking forward to being closer to family. In the meantime, I will try to get as many recipes to you as possible. 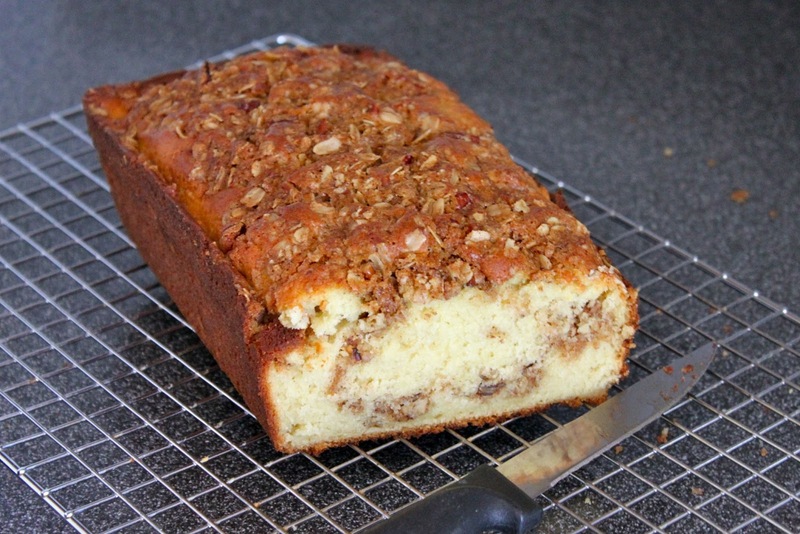 This bread, which is really a cake, is delicious and perfect for a autumn breakfast. The recipe is from Cooking Light and called for walnuts, but I am a much bigger fan of pecans so I swapped them. I was actually surprised how delicious this recipe turning out being that it is a dessert from cooking light. I will definitely be making this again. To prepare bread, combine flour, baking soda, baking powder, and 1/2 teaspoon salt in a bowl, stirring well with a whisk. Combine 5 tablespoons butter and granulated sugar in a large bowl; beat with a mixer at medium-high speed until well blended. Add eggs, 1 at a time, beating well after each addition; beat in vanilla. Beating at low speed, add flour mixture and buttermilk alternately to sugar mixture, beginning and ending with flour mixture; beat just until combined. 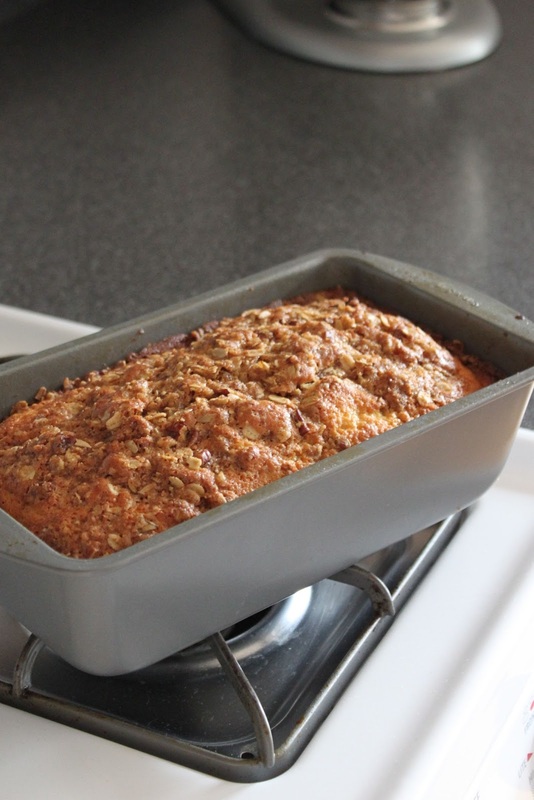 Scrape half of batter into a 9 x 5-inch loaf pan coated with baking spray; sprinkle with half of streusel mixture. Spread remaining batter over streusel; swirl. Sprinkle remaining streusel on top of batter. Bake at 350° for 50 minutes or until a wooden pick inserted in center comes out with moist crumbs clinging. Cool 10 minutes in pan on a wire rack. Remove from pan; cool completely on wire rack.